Johns Hopkins Medicine is committed to supporting the discovery of new ways to improve the care and outcomes for patients. Patients throughout the Johns Hopkins Health System have access to a network of clinical research studies for many different conditions. In November 2016, the Johns Hopkins Research Participant Recruitment and Retention Program piloted a program to inform patients of research studies through automated MyChart Recruitment Messages. Our goal is to empower patients by connecting them with clinical research studies that may be of interest to them. In a recent survey, we assessed what patients think about MyChart research invitations; 90 percent of surveyed patients agreed that invitations to join research studies are an appropriate use of MyChart. 60 percent reported it did not change their satisfaction with being a patient at Johns Hopkins, and 40 percent reported it increased their satisfaction with being a patient at Johns Hopkins. Below are the responses to frequently asked questions by patients regarding how we use MyChart messages to link patients and research studies. Why did I receive this MyChart recruitment message? You have received this automated MyChart recruitment message because you have demographic characteristics such as age and gender and medical history information such as diseases or operations you have had in your digital medical record that met criteria for the related clinical trial. How did the researcher get permission to contact me? Researchers receive permission from the Johns Hopkins Medicine Institutional Review Board (IRB) to send automated MyChart recruitment messages to a group of patients who may be eligible for a study. Did the researchers of this study look at my medical record or know my name? No. The research team did not look at or gain access to your medical record. All of the MyChart recruitment messages are sent by the Johns Hopkins Research Participant Recruitment and Retention Program. This office has a small staff who know how to search our patient databases to find patients that might be eligible for a study. What happens if I ignore or delete this message? Your care at Johns Hopkins will not be affected if you ignore or delete this message. Your clinical care team will most likely not even know if you agreed to join the study. Please note that you may receive an automated MyChart recruitment message again unless you unsubscribe. How frequently will I get MyChart research recruitment messages? 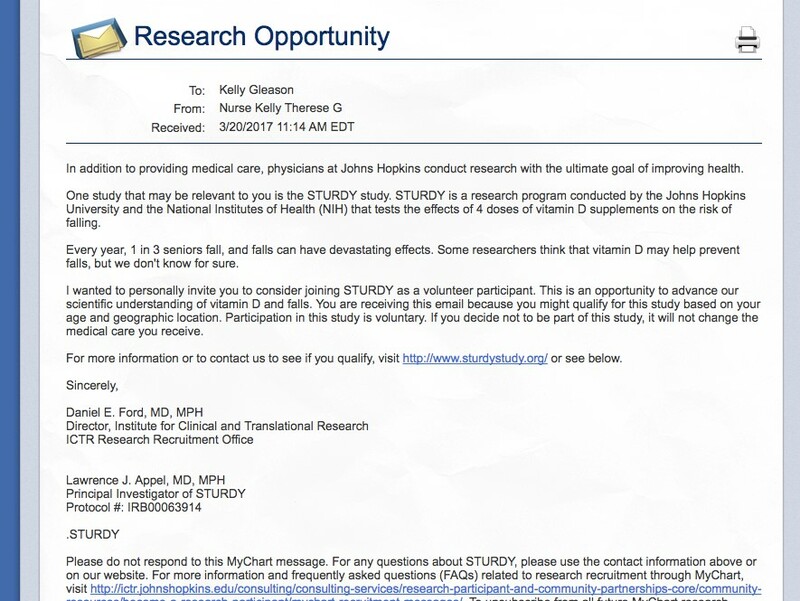 Our Johns Hopkins Medicine Policy is to limit messages to only one research invitation a month. There may be some circumstances where we exceed this limit but this is not our intention. What should I do if I don’t want to receive these kinds of MyChart recruitment messages again? You can unsubscribe from future MyChart recruitment messages by emailing Research_Recruitment@jhmi.edu. Who should I contact with further questions about MyChart recruitment? Please call 443-831-8520 or email research_recruitment@jhmi.edu if you have any further questions. We will be happy to hear from you. The STURDY Study aims to understand fall reduction and vitamin D in older adults. This study aims to determine whether an air cleaner intervention to improve home air quality will improve respiratory symptoms, quality of life, lung function and reduce risk of exacerbations in former smokers with COPD.